Tina M. Brooks received a B.A. in History and Spanish from the University of Northern Iowa in 2005, a J.D. from the University of Nebraska College of Law in 2009, and an M.S. in Information Studies from the University of Texas School of Information in 2011. 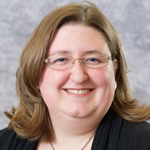 She joined the University of Kentucky Law Library Faculty in July 2011 as the Electronic Services Librarian. In addition to her library duties, which include managing the law library website and the library’s electronic resources, she teaches two sections of 1L Legal Research.